94216YL Yatming Road Signature - 1967 Chevy Camaro Z28 Hardtop. 1:43 scale diecast collectible model car. 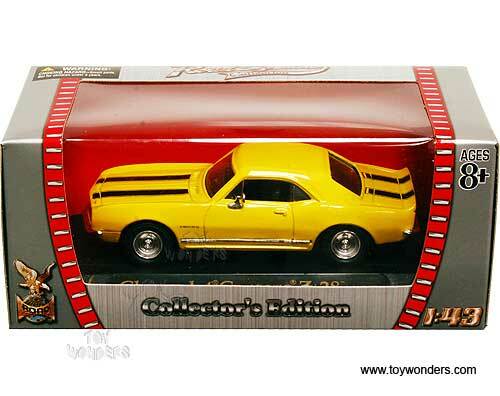 This Chevrolet Camaro Z-28 Bumblebee is a 4.25"L x 1.5"W x 1"H diecast metal car. Sits on a display plaque. Road Signature collection. 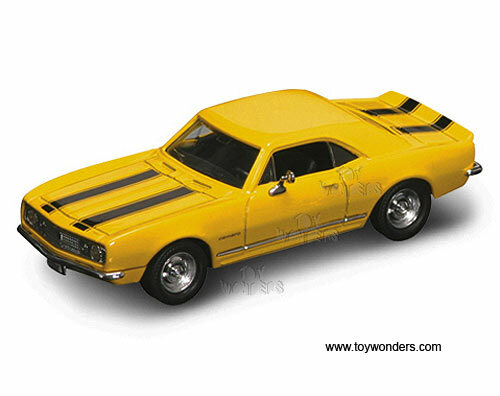 The 1967 Chevy Camaro Bumblebee Z/28 is manufactured by Yat Ming. 94216 is YELLOW in color with Black stripes. Individually packed in a window box. Box size: 6"L x 3"W x 2.5"H. 12 pcs per inner. GM is a trademark of the General Motors Corporation. To see more Chevy Camaro die-cast collector vehicles (click here).